The 564 High Output Gas Fireplace offers the same viewing area as the 564 Space Saver, but with higher heat transfer, neo-ceramic glass, the choice of three different burners, and is capable of heating up to 1,400 square feet. 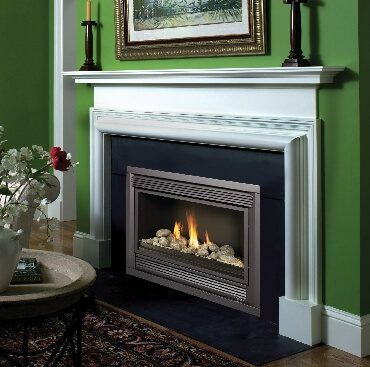 With standard fans and 35,000 BTUs ,this gas fireplace is designed to deliver the heat! This 564 HO features "film cooling" technology, allowing for more flexible installation applications and closer clearances to combustibles. For added convenience, this model comes standard with the GreenSmart Remote which provides full control over this fireplace from the comfort of your favorite chair. With the 564 High Output Gas Fireplace, you have the ability to heat your family's main living area or duct up to 30% of the heat to adjoining room(s) 20 feet way using the optional Power Heat Duct Kit.